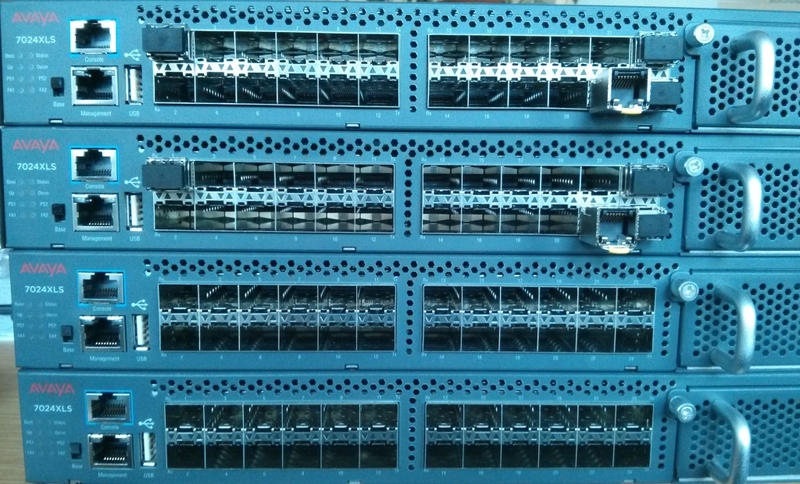 I was really impressed as I started my first SPB configuration on an Avaya switch, I had a 200 lines MPLS like configuration in mind and was surprised that you do not need a lot of commands to setup SPB. I walk you through the basic steps that you need for SPB. Here in this post I will only cover the basic setup. First you need to enable SPB globally to get started, this requieres a reboot on the VSP7k and the ERS4k. At the ERS8k you need a premier license to get started. In the next step we have to create 2 SPB backbone VLANs. You can choose any VLAN ID you like. It is recommanded by Avaya to use 4051 and 4052. Than give your device a name. The sys name that you see on the CLI prompt is also used in SPB for L2 pings and trace routes. Here you should use something that is human readable. Now we go to the router ISIS configuration and configure the area. BTW the 49 has nothing to do with country dial up code for Germany. It is the default area that we are using here. The system-id and nick-name have to be unique in your network. You can choose what ever you want, but make a good documentation of what you have done to prevent that never 2 devices uses the same ID. I usually borrow the numbers from the device IP adress for example the switch management IP would be 10.10.10.10 than I translate these digits into the nick-name and system-id. The last step would be to enable SPB on the interfaces that you would like to use. It can run on a single interface or MLT. You only need dot1q encapsulation or tag all in Avaya terminilogy enabled on the particular ports or trunks. Note on the VSP7k it is only interface “ethernet” this can be diffrent like e.g. interface gigabitEthernet on the VSP4k depending on the device type and software. Thats the complete basic configuration, your device is ready now to connect to anonther switch with an SPB configuration on port 1/1. Now you can create services that run over the SPB fabric like e.g. VLAN 2000 will mapped into I-SID 20002000 as a L2VSN service. You can move an access port into VLAN 2000 that will be transported over the I-SID 20002000. On Any other SPB enabled switch in your network you would only type the two commands above and also add an acces port to VLAN 2000 that would provide L2 connection between these two acces ports. It is possible to use different VLANs on different switches, as long as the I-SID ID is the same you will have a connection. There are no configurations needed on any uplink ports no matter if the switches are directly connected or any number of switches are between them in the nwtwork path. In the moment you create the I-SID SPB will provide the shortest path across the network. Dominik, I am working on a config and have a question. I have a VSP4000 and VSP8K that will not form ISIS adjancies. But the same 8K will form them with an ERS4800. I’ve heard that the order of configuration can sometimes cause unpredictable behavior. Is that true on the VSP4K’s? Or is the BOSS versions? Just after sending this, I reloaded the VSP4K. When it finished booting, it did come up as an adjacency with the ERS and 8K surrounding it. Maybe I did configure it out of order which hung it. If so, would reloading it have forced the OS to read the configuration in the correct order, thereby successfully loading the config in the correct order? Normally the SPB / ISIS configuration is pretty robust. In some cases it is needed to restart ISIS on the device. More common is that you have an problem with the link, vlacp, etc. That causes an issue with forming up an adjacency. Was this the initial setup for the VSP or an config change ? Thanks for your post. Are there any restrictions or interactions between spbm and spanning tree? 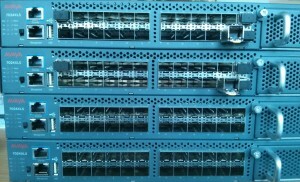 I had two switches(vsp7200) configured (by a service provider) similar to your description above and both worked fine. I recently enabled both switches to run rstp for their uplink with other switches in the network. Upon reloading the switches as prompted, I noticed isis was no longer enabled globally and the spbm vlans had dissappeared. I’m really just trying to understand the interaction between spbm and rstp before trying to restore the commands. Any pointers to helpful documentation would be great. The Isis Interfaces are all L3 only, so no STP of any kind here. So that was most likely causing your situation, when you configure RSTP you removed the Isis configuration. In a SPBM fabric the STP is only still active on access ports. Does this mean if I disable RSTP on the specific interfaces, I will be able to re-apply the SPBM config, i.e. re-create the backbone VLANs and enable ISIS. You need to stick with MSTP, if you configure an other STP mode SPB is be disabled. I have a question in regards to the ISIS LSDB and SPB adjacencies. Im trying to figure out how many SPB adjacencies we have in are network (very large network), I was wondering if there is a easy way of doing that other then logging into every Avaya VSP out there and count them. Would the LSDB database cover this for me? Thanks for your help in advance. How does SPB perform over slow (10 Mbps) links?